The Ontario Climate Consortium is hosting the 6th Ontario Climate Symposium at Canada’s biggest art and design university, OCADU. 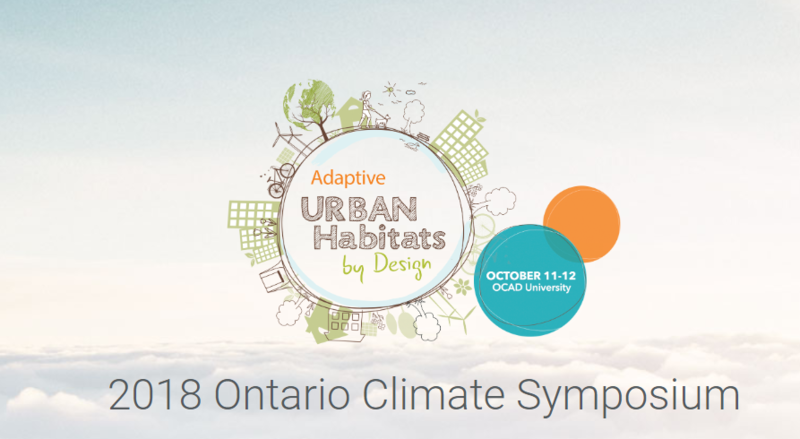 This year the Symposium will take place on October 11th and 12th, and will explore how innovative, interdisciplinary visions can facilitate a cultural shift toward low-carbon communities, sustainable adaptation and the adoption of green infrastructure. Aimed at fostering a collective discussion on urban landscapes, the morning panels will highlight how green infrastructure, policy, design, resilient thinking, and stakeholder engagement can transform future cities and urban development in the face of climate change. GIO’s own Michelle Sawka will be part of a panel exploring “Are our cities prepared for climate change – and what role can green infrastructure play in mitigating the impacts of a changing climate?” Amongst architects, ecologists, engineers, sustainability analysts, and urban farming advocates, she will join thought leaders in exploring the value of Greening the Grey in a world of constant and rapid urban development. Day two will kick-off with a workshop hosted by the Green Infrastructure Foundation to discuss how a lack of clear valuation of green infrastructure can limit its incorporation into asset management decisions. The workshop will engage participants to learn how they can value the benefits of green infrastructure in their communities. The symposium will play host to a variety of other concurrent sessions that highlight research, policies, and initiatives that blend technology, art, and nature.